Any list ranking the top OTT video services would not be accurate if it did not have Netflix perched on top. But a new report from Parks Associates digs deeper in to the world of OTT video services and reports how others fare in comparison to the mighty Netflix. The report titled ‘OTT Video Market Tracker’ lists the top 10 subscription based OTT video services operating in the United States. Surprisingly, top 3 of them have no sports affiliations and most of them did not exist before last couple of years. This report is an indicator of the industry health and the progress of the smaller players like HBO Now that debuted in April or Sling TV that was launched in February. 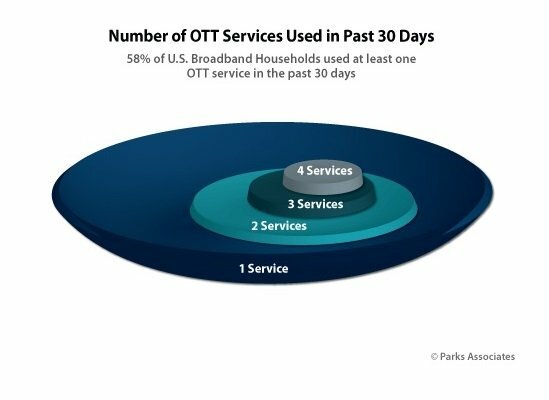 Despite Netflix’s lead, the report suggests many customers toggle between multiple services, which is almost 25% of US broadband homes.